On Saturday 3 November, Jan ZS1VDV and Paul ZS1V left Stellenbosch at 06:00 to visit the 145.625MHz repeater site at Voorstevlei near Piketberg. Towards the end of October the UHF radio for the link from Piketberg to Hawequas locked into transmit. 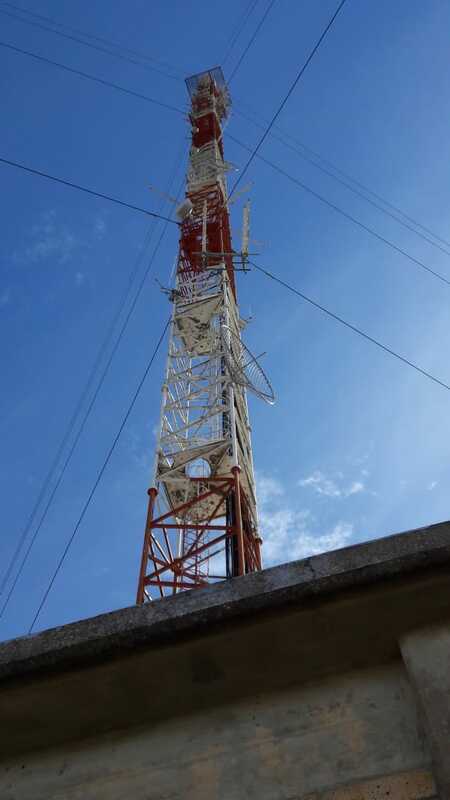 The link repeater at Hawequas had to be temporarily disabled to prevent the rest of the link network also locking in transmit. The team arrived at the Piketberg site at around 8am. The problem was narrowed to a faulty buffer chip in the link controller. The chip was replaced with a spare and the fault cleared. The link controller was also updated to the latest firmware. A bandpass filter was also added to the receive path. That eliminated interference from a nearby DMR repeater. At 09:45 the team packed up and departed Piketberg for Hawequas. There, the link controller settings were adjusted and a damaged connector seal on one of the antennas was repaired. The exterior temperature sensors at both Piketberg and Hawequa have not stood up to the elements and are faulty. The team arrived home just after noon. Jan (ZS1VDV) and John (ZS1EQ) did a round trip to service 3 sites. Started to load the bakkie 07:00. At the end of 2017, the Piketberg VHF repeater was removed. The repeater was serviced by Verstay. The final transistor was replaced. A replacement duplexer was prepared during the week. The duplexer was swapped out and VHF repeater reinstalled. SWR between duplexer and VHF radio was 1.2 and between the duplexer and antenna 1.3. Left Piketberg 11:15 and was on Hawequa at 12:45. The 10 amp battery charger was swapped out for a 7 amp battery charger. The 10 amp is designated to go to Hanskop. Left Hawequa 13:45 and reached Bottelary at 14:45. Removed the UHF DMR repeater for service. Back in Stellenbosch and unpacked by 16:15. ZS1VDV went to Piketberg on Saturday to resolve 3 issues. This was suppose to be a quick 2 hour visit, but again turned out to be much more. The morning started around 09:00 on site. The first step was to investigate the circulator as it was suspected to be the reason for the power drop. After checking the circulator and 2nd harmonic filter with a mobile network analyzer they where found to be in order. (about 0.5db insertion loss on circulator and a 40db filter on the 2nd harmonic). It was then found that the duplexer was causing a 1.7 SWR on the TX path. This was very strange because the duplexer was tuned on last visit. The duplexer was removed from the rack and rechecked and found that the possible cause for the hi SWR is wrong length linking cables between the cans. They only onsite solution was to “play” with the tuning of the duplexer (the result was that about 10db isolation was lost). This is not optimal, but would still work. The SWR now was 1.1 between the duplexer and circulator. This however did not take the power reduction away. The last step was to test the repeater on its own with an SWR meter and dummyload. No SWR problem, but the cause for the power reduction was found. The internal filters of the repeater needs to be re tuned and this cannot be done on site. The filter was added to the fan of the link radio. Emphasis settings was changed on the link radio and link cable updated on the repeater. Audio was aligned. At this stage it was about 13:30 with no water or food, this became a very long day. On Sunday ZS1VDV returned to site to recheck the audio alignment and a few small tweaks was made. The repeater and duplexer needs to be swopped out. The repeaters filter re tuned and the proper length linking cables for the duplexer made. ZS1DDK and ZS1VDV started just past 05:00 in Bellville. Loaded all equipment and left Stellenbosch 06:00 for Piketberg. Arrived 07:45 at Piketberg Site. The controller was set to key the link on COS, with the problem that this was too often. The duplexer was not tuned well enough. The SQL of the VHF Repeater was set to 0.25microVolt. The controller was set to key the link on the presence of CTCSS(PL) and COS(SQL). The circulator was installed between the VHF repeater and duplexer. The controller FW was updated. Left Piketberg site around 11:30. Quickly had lunch in Wellington. Arrived at 13:45 at Hawequa. UHF Repeater was not TXing. The repeat setting on the controller was in an inconsistent state, this was due to deactivation which was done 15 Feb to protect the TX radio. The setting was deactivated and the reactivated. Left Hawequa site around 14:15. Arrived 15:00 in Stellenbosch unpacked. Finally got home at around 15:45.